The 2011 Commonwealth Reading Series of events with MCC writers and poets concludes with a reading at Newtonville Books in Newton on Tuesday, April 5, 7 PM. 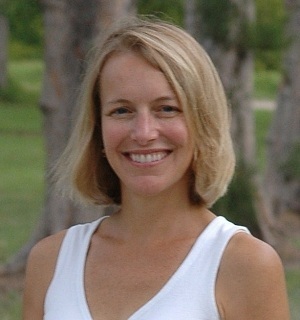 One of the participants in the 4/5 Newtonville Books reading is Leslie Williams (Poetry Fellow ’10), whose poetry collection Success of the Seed Plants was published by Bellday Books in 2010. We asked Leslie about Success and the secrets to her winning ways. ArtSake: You won the Bellday Books Prize and the Robert H. Winner Award from the Poetry Society of America in the same year you won the MCC grant. You’ve cracked the code to poetry contests! Please promptly divulge your secrets to success. Leslie: Good things happen in threes! Honestly, I was floored by all of these at once, after years of writing quietly without a lot of encouragement. I would say the secret is a bit of stubbornness, continuing to send my poems out year after year and not paying much attention to rejection or silence on the other end – that is, writing the poems I wanted or needed to write and then seeing where it felt right to send them. I am not very savvy about it. I’m so grateful for the recognition! ArtSake: Your poems are so invested in the places they’re set. I’m thinking of “So Long,” which compares nostalgia versus memory to Cape Cod’s breezy summer tourist season versus its more severe history of whaling and hardship. Does the place you are writing in – and about – change the way you write? ArtSake: As a David Lynch fan, I must ask: is “The famous director said I love to see people coming out of darkness,” which explores an encounter with the film director’s ex-wife that has a profound effect on the narrator, autobiographical? Leslie: How did you know? I did start out with David Lynch, because I thought his line was a terrific way to explain things, not only visually, but emotionally. I wanted to write a poem that did a similar thing. James Merrill said that once a poem really gets going, it’s like an eddy, and everything just gets sucked into it – that’s what happened here – random bits of experience started sticking, such as meeting a woman at a party who let me know she’d been married to a celebrity, and too many details about it. I find it amazing that strangers will unburden themselves in these settings and then move on, never to be seen again – you’re left carrying these odd pieces of their lives that you don’t really have a place for and don’t know what to do with. I should say a word about the “I” – I am always inventing personae who can trip around in poems – as Emily Dickinson wrote: “When I state myself as the representative of the verse, it does not mean me, but a supposed person.” There are always elements of autobiography, I don’t think any honest writer could disavow that, but then the imagination goes off and leaves your actual self behind. ArtSake: Your poetry is rich with details from the natural world. Do you have any background in that area – an amateur gardener, a former plant biologist, perhaps? Or is it mainly a poetic interest? Leslie: I am a very amateur gardener! I did study biology for a while and was completely fascinated with plant life and dissecting earthworms and trying to watch tulips actually burst out of the soil on a really warm spring day. The world is enormously beautiful and mysterious and I just try to capture that and, I hope, to praise it. I have such a metaphorical turn of mind that everything in nature seems to have a lesson in it, for me. ArtSake: Can you point to any one decision you’ve made as an artist that has had the most impact on your career? Leslie: Thank you for calling it a “career” – it doesn’t always feel that way, so it’s edifying to have recognition by the MCC and others, that makes me feel I’m on the right track. I wish I could say I made “decisions” in the sense of strategy, or even in being fully conscious about the work of poetry. The main thing for me has been sticking to it over the long haul, which is not really a choice, as anyone who writes poems knows – even in the dry spells there are little nagging lines and phrases in your head that call you back. For me it’s been crucial to find a group of serious working poets to meet with on a semi-regular basis. I was fortunate enough to stumble into the most magical summer group the first summer we moved here and that too has really sustained me. ArtSake: What writers and poets are you excited about, these days? Leslie: So many! I read in phases and right now it’s autobiography, so Mary Karr and Reynolds Price, who just died, and Patti Smith, though I was disappointed in that one. Poetry I dip into all the time so right now on my desk is Larry Levis, Robert Hass, Amy Clampitt, A. R. Ammons, Gjertrud Schnackenberg and an anthology of the Romantics. I always go back to Stevens, Hopkins, and Bishop, even though I try not to like her so much. Right now I have a small obsession with Lisa Robertson’s R’s Boat. I love reading poems that are energizing, that make you want to move – which is a really difficult charge. Leslie will join Regie Gibson, David Lovelace, Tova Mirvis, and Lara JK Wilson for a Commonwealth Reading Series event at Newtonville Books in Newton on Tuesday, April 5, 7 PM. 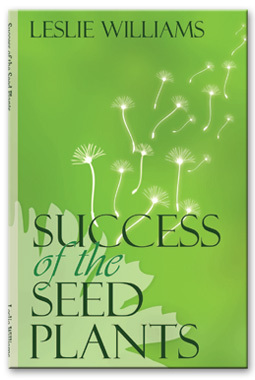 Leslie Williams is the author of the poetry collection Success of the Seed Plants (Bellday Books, 2010), which won the 2010 Bellday Books Prize. She is also the recipient of the Poetry Society of America’s Robert H. Winner Award, an Illinois Arts Council Artist Fellowship, and awards from the Ragdale Foundation. Her poems have appeared in Poetry, Slate, The Southern Review, Shenandoah and in many other magazines. A North Carolina native, she now lives near Boston with her husband and two sons. 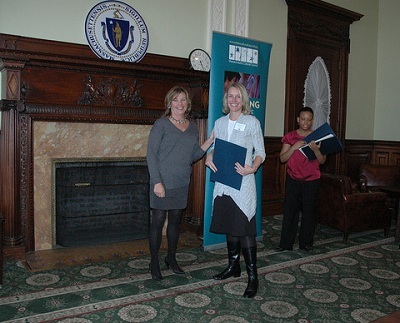 Images: Leslie Williams, photo by Ira Jacobs; cover art for SUCCESS OF THE SEED PLANTS by Leslie Williams (Bellday Books, 2010); MCC Executive Director Anita Walker with Leslie Williams at the Massachusetts State House, November 2010.